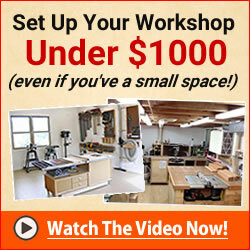 This is a really easy woodworking project that is also quite fun to do. You could easily have this done in a day or have a dozen or so made over a weekend ready to be sold the following weekend at any trade show or market. 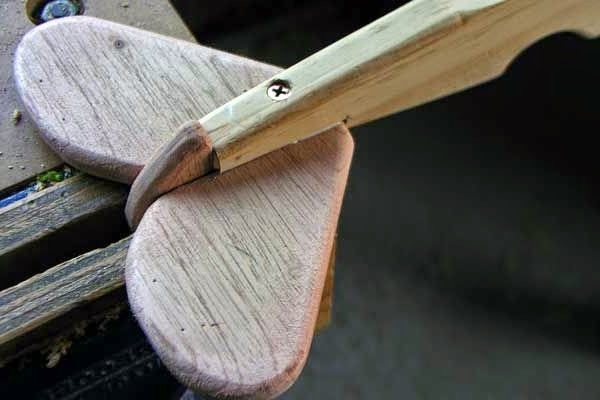 Basic woodshop tools are all that are needed and the plane itself can be made from scrap wood. Imagine handing this completed woodwork project to your son, nephew or grandson. I am sure they would have tonnes of fun with it. First off, if you are planning on making a large number of these to sell then I would recommend making templates so that you can quickly trace out the shape of each of the constituent parts. 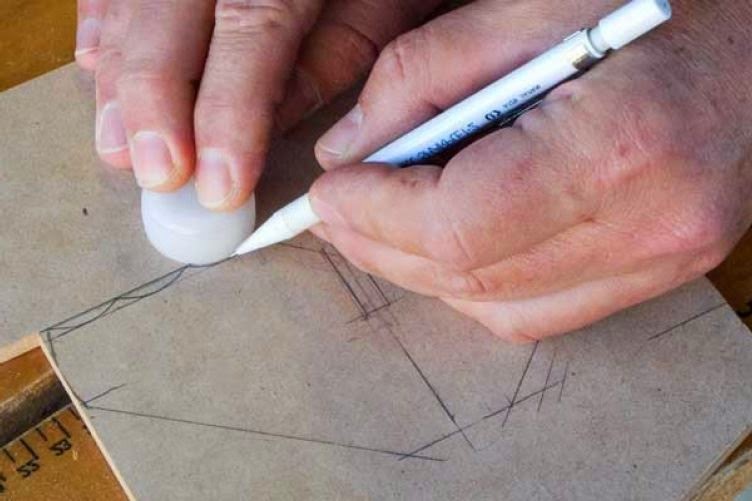 If you are just making one then using the drawings as your guide start drawing the outline of the wooden toy airplane parts. Draw out the shape of the nose and the shape of the fuselage onto the sheet of 19mm (3/4") thick pine. Cut out these parts using a bandsaw, jigsaw or coping saw. Glue the surfaces of the nose and fuselage that will be coming into contact with eachother. Position the nose onto the plywood and drill a pilot hole through the nose and into the fuselage. Allow the glue to dry. 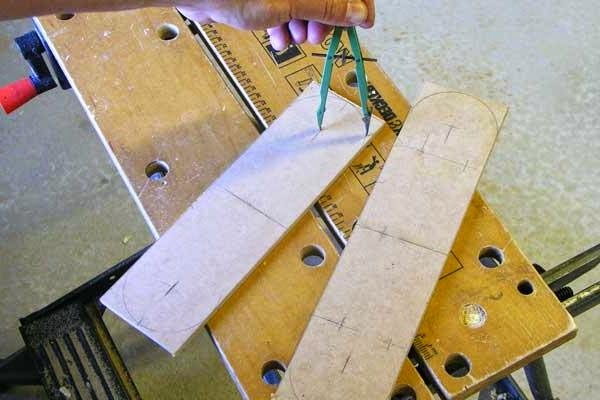 Draw out the shape of the tail plane and rudder onto the 12mm (1/2") thick pine board. Note the way I used a bottle cap to add a serrated effect on the trailing edge of the tailplane. Cut out the shapes using a bandsaw, jigsaw or coping saw. 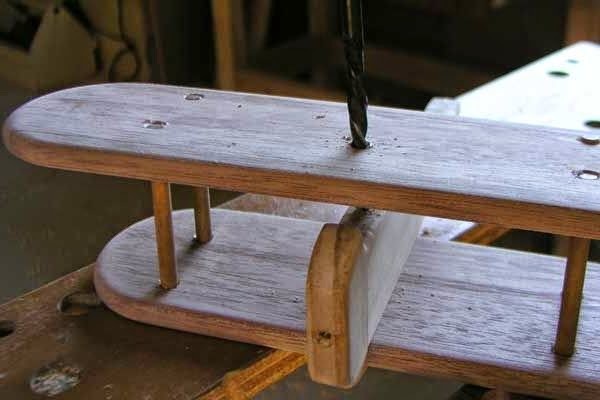 Using a piece of 12mm wood and starting from the trailing edge of the tailplane, trace out the thickness of the notch into which the rudder will slide. The notch at the aft section of the fuselage will give the distance required to finish off the outline of the section to be removed in the tailplane. Before the tailplane and rudder are glued together it would be a good idea to round off and sand the edges. This is much easier to do before they are glued together. The assembly is held in a c-clamp whilst the glue dries. 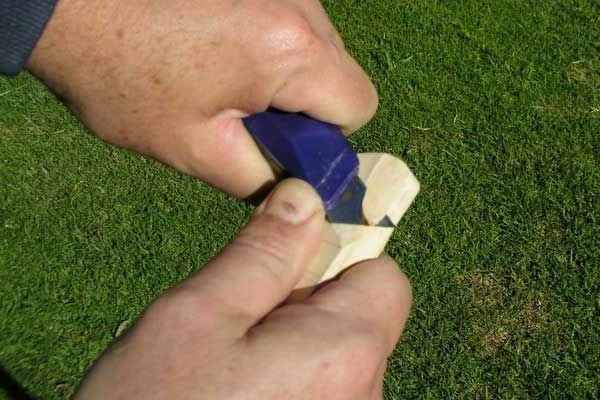 Ensure that the rudder is 90 degrees to the tailplane using a small set square such as one you would find in highschool mathematical set. The wings are cut from 1/2" pine board. The shape of the wing is simply traced out onto the pine board and then cut using a bandsaw or jigsaw. I chose a round wingtip profile. I feel that this gives the biplane a softer profile. 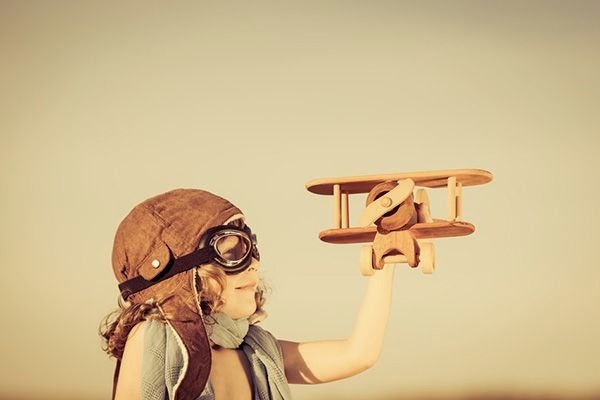 Choosing not to have any sharp points on the project is a good idea if the toy will be used by young children. Once the top and bottom wings have been made they are positioned one on top of the other and then the holes are drilled which will receive the dowels. 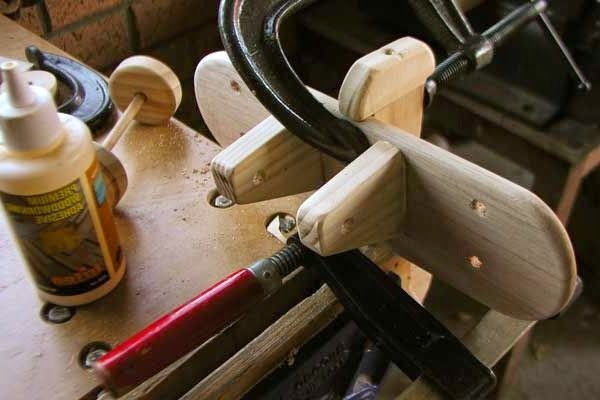 The dowels will give strength to the structure as well as giving the biplane an authentic look. The landing gear is comprised of two struts and is made using the 3/4" pine boards. These are later attached to the bottom wing. As with the tailplane and rudder assembly it would be a very good idea to round and sand the edges before attaching to the rest of the plane. Position the landing centrally underneath the bottom wing. Each strut is screwed and glued to the bottom wing. Now the airplane is really taking shape! The fuselage is bonded to the bottom wing using glue and a couple of screws. 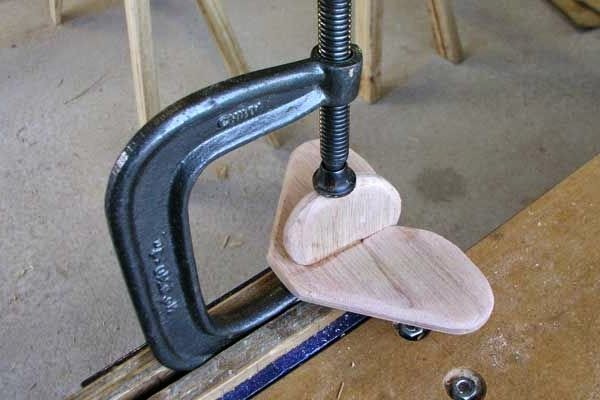 The piece is clamped tightly while the glue dries. The empennage is screwed and glued to the fuselage. The underside of the fuselage and tailplane is shown below in the photo. Cut the dowels (4) that will be used to space the top wing from the bottom wing. 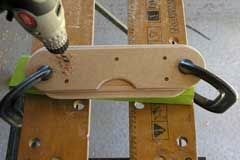 Glue is applied to the dowel ends and they are then inserted into the holes that were drilled in step 4. Finally a hole is drilled in the middle of the top wing following through into the fuselage. A dowel will be glued and inserted into this hole. The wheels are made using a hole saw and the 1/2" pine wood. The axle is cut to length from a dowel. A good idea here is to make the holes slightly larger than the diameter of the axle. The wheels are glued to the axle. 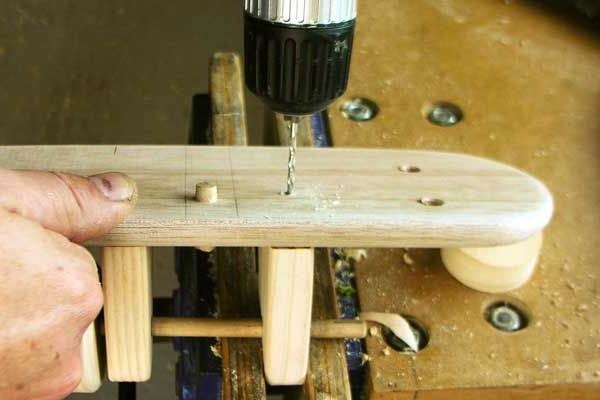 Tip: Applying some linseed oil will lubricate the axle and reduce sqeaukiness when the child is playing with the toy. This the last step. The propelleor is made from the 1/2" pine wood and may be carved using a Stanley knife to make it look more realistic. Tip: A more detailed plane will higher money if you plan on selling the plane(s).